You might remember last summer’s story of China’s amazing straddling bus (which is really a train, as it runs on tracks). 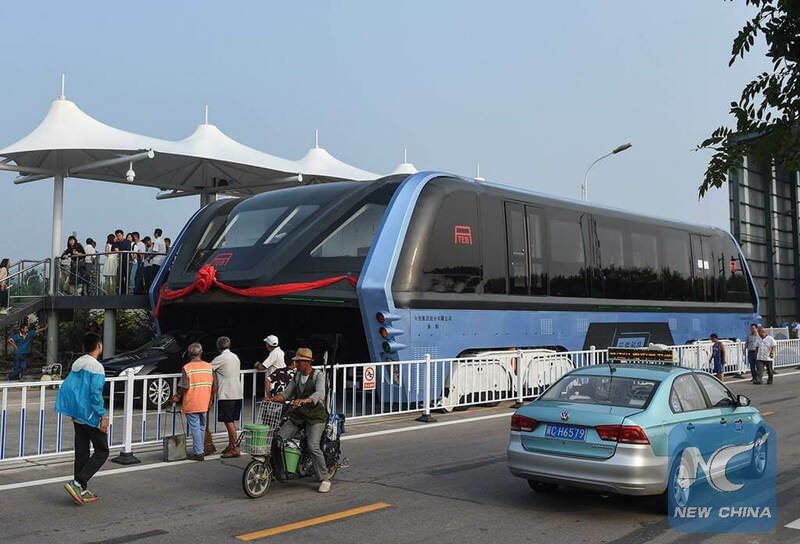 The concept design for the transit elevated bus, or TEB, had been around for years, and reports from Chinese media claimed a completed version had just finished its first road test. But it didn’t take long before the project started looking decidedly suspicious, and now it seems that the entire thing was just a scam. Six months after the alleged road test, the firm responsible for the TEB admitted it was actually part of “internal testing.” More questions were being raised about the design, such as how would large vehicles pass under it, and accusations of illegal crowdfunding started to surface. The TEB itself, meanwhile, was at this point lying abandoned in the middle of a road that had been leased to the company. On Sunday (July 2) it appeared that the entire TEB project was nothing more than a scam after police in Beijing announced they had started investigating and arresting people involved. More than 30 individuals have been held, all of whom were connected with Huaying Kailai, an online capital raising firm that had been selling an investment product for the bus. One of those in custody is platform owner Bai Zhiming, who is also chief executive of TEB Technology Development, a company that purchased the patent for the bus. The TEB’s investment offering was sold as a private fund with a starting price of $150,000, promising an annual return of 12 percent. Authorities are now trying to recover the funds from Huaying Kailai, and are advising investors to take their complaints to local police stations. The Southern Metropolis Daily reports that 72 investors have field lawsuits against Bai and his company, which had raised around $1.3 billion by October 2016. Things were already looking bad for the TEB when it was revealed in December that Suzhou-based design firm Autek was still owed $6.5 million for its work on the project. And last week, the TEB was moved to a nearby parking garage after officials had said they planned to demolish the 300-meter tracks it ran on. While the TEB may be dead and buried, China can still boast the Autonomous Rail Transit (ART) smart bus, which doesn’t require tracks that are embedded into the ground – and isn’t a total scam.